Australia's largest ever diet survey has confirmed that the vast majority of Aussies eating habits are below par. The 2016 CSIRO Healthy Diet Score report , released today, canvassed the dietary habits of more than 86,500 adults across the country over a 12 month period. An early snapshot of the survey results released in August 2015 awarded the nation's diet a score of 61 on a 100-point scale. 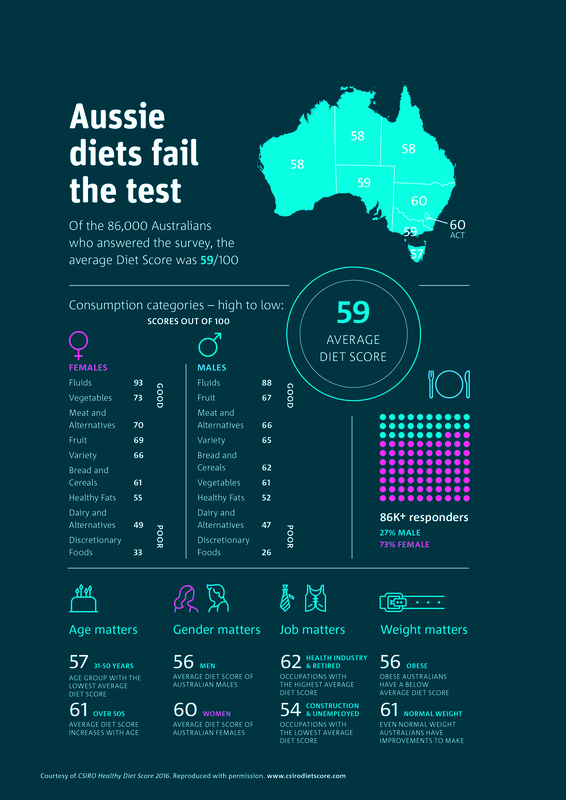 With almost 47,000 additional surveys completed since then that figure now stands at just 59 out of 100, confirming that Australian diets are worse than first thought. "We have an image of being fit and healthy, but with a collective diet score of 59/100 that image could be very different unless we act now," CSIRO Research Director and co-author of the CSIRO Total Wellbeing Diet, Professor Manny Noakes said. According to the 2016 Healthy Diet Score, 80 per cent of respondents received an individual score below 70, which is a benchmark figure. "If we can raise our collective score by just over 10 points, we help Australia mitigate against the growing rates of obesity and lifestyle diseases such as heart disease, Type 2 diabetes and a third of all cancers, Professor Noakes said. "All people need to do is halve the bad and double the good. In other words, halve the amount of discretionary food you eat and double your vegetable intake." People across Australia, in all occupations and age groups were invited to participate in the online survey between May 2015 and June 2016. CSIRO researchers have used this information to create a detailed picture of the country's eating habits. The closest we get to meeting Australian Dietary Guidelines is the fruit food group where 49 per cent of respondents meet the recommended intake. That means one in two of us still have room to improve. But of greater concern is dietary performance in regard to discretionary, or junk foods. Just 1 per cent of Australians are abstaining from junk food, while more than one third admitted to eating more than the recommended maximum allowance. "We find that there is often a tendency to under-report on certain types of food, so in all likelihood that figure is even higher," Professor Noakes said. The report showed that women have better nutritional levels than men (60 v 56/100). Construction workers were among those with the poorest diets, while public servants, real estate agents and health industry workers reported some of the healthiest eating patterns. The 2016 CSIRO Healthy Diet Score also tracked food avoidance in diets for the first time, and found that approximately one in three Australian adults are avoiding one or more foods such as gluten, dairy or meat. To get involved CSIRO is asking people to undertake The Healthy Diet Score – a free online assessment which evaluates diet quality and identifies individual areas of improvement, as well as providing a personal diet score out of 100. "It is never too late to eat better and increase your score, and the nation's," Professor Noakes said. "We encourage people to also take the test regularly to ensure they are improving their eating behaviour and overall health and wellbeing." Of the 86,000 Australians who answered the survey, the average Diet Score was 59/100. How do the diets of Australian men and women compare? 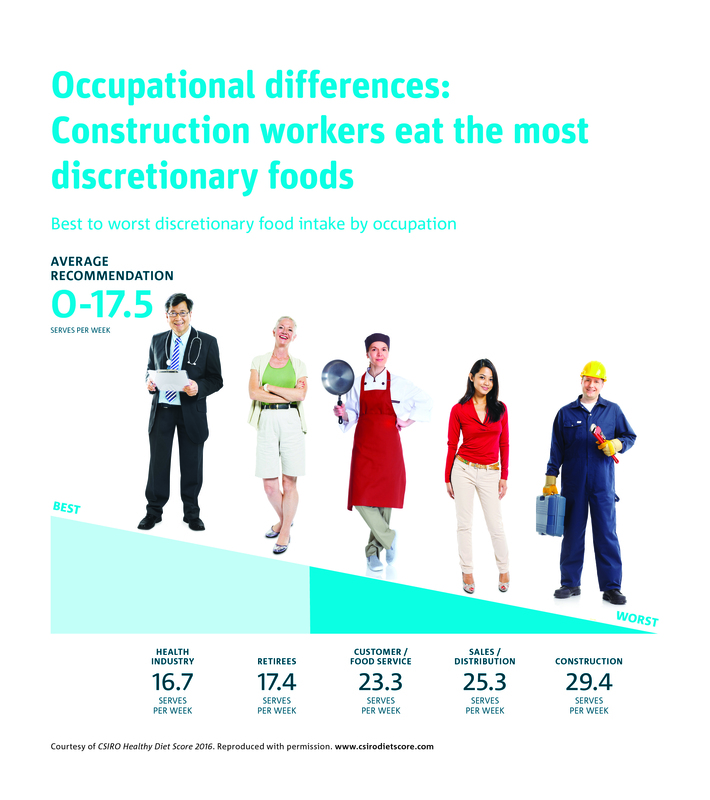 Discretionary food intake influenced by occupation. 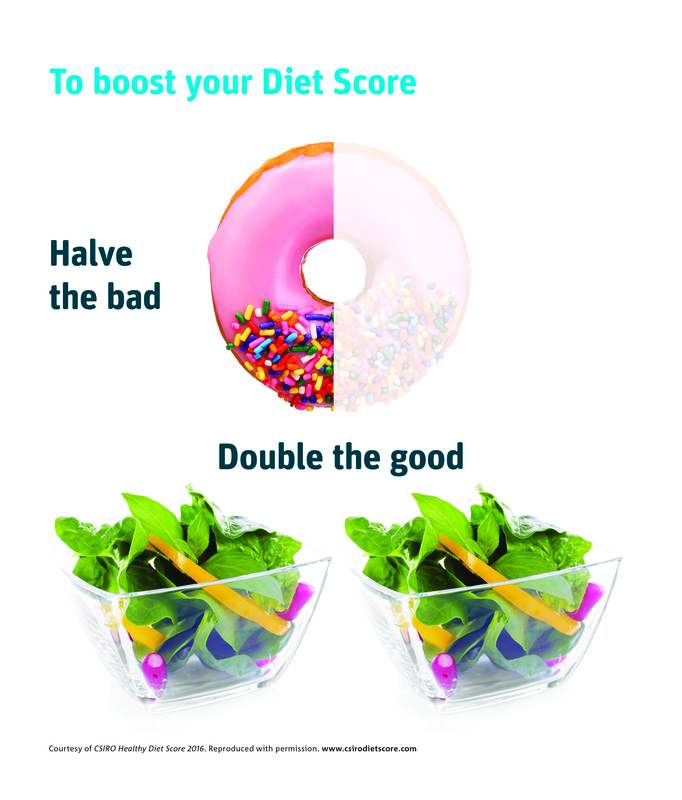 Halve the bad and double the good to boost your diet score. 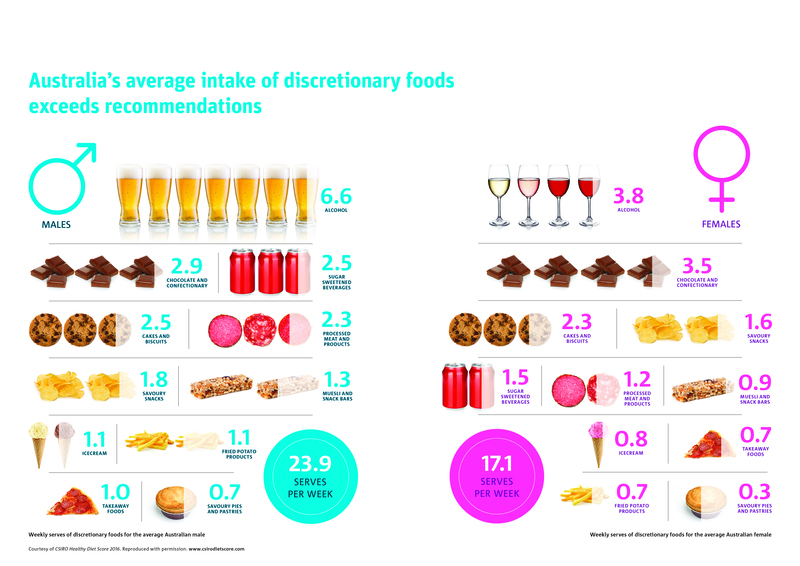 Australia's average intake of discretionary foods exceeds recommendations. The Healthy Diet Score was developed by CSIRO and validated in a population of free-living Australian adults aged 19-50 years. The Healthy Diet Score is a short food survey designed to assess compliance with the 2013 Australian Dietary Guidelines (ADGs) and Australian Guide to Healthy Eating (AGTHE). The survey questions ask about frequency and quantity (in servings) of consumption of fruits, vegetables, grains, meat and alternatives, dairy, discretionary foods (cakes, confectionary, processed meats, alcohol, take-away foods) and beverages, as well as addressing the quality of core foods (frequency of wholegrain and reduced fat dairy) and variety within core food groups. The resulting diet quality score out of 100.